Special Collections and Archives, Georgia State University, Atlanta. 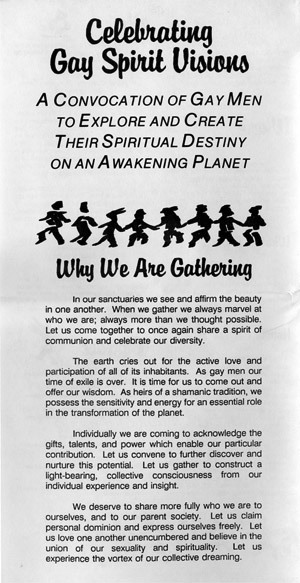 Simply titled “Celebrating Gay Spirit Visions,” our first fall conference in 1990 was inspired by a tradition of gay men’s gatherings held from 1978 through1989 at Running Water, a farm and retreat center in the mountains of North Carolina. In 1978, Running Water owner Mikel Wilson invited a men’s caucus from the Southeastern Conference for Lesbian and Gay Men to meet at his mountain homestead, hoping such a gathering would encourage discussion and exploration of spirituality and alternative gay male identities. John Jones, Rocco Patt, Peter Kendrick, and Ron Lambe purchased Running Water from Mikel Wilson in 1979, desiring to live and develop an intentional community there. They incorporated as Stepping Stone, a legal entity holding the title to Running Water. Soon, twice-yearly gatherings were scheduled and Running Water became one of the sanctuaries of the Radical Faerie movement. RFD, A Country Journal for Gay Men Everywhere was published at Running Water from 1980 to 1988. But by 1989, development around Running Water made large events there impossible and the land was sold. Running Water was gone, but fortunately Stepping Stone wanted to sponsor an alternative event. Former Running Water dwellers Peter Kendrick, Ron Lambe and Raven Wolfdancer, all Radical Faerie veterans, hoped to keep the energy of earlier gatherings alive. But they also wanted to refocus and create a less anarchic, more structured event accessible to gay and bisexual men of all spiritual paths. A new location had to be identified as well. The Mountain, an affirming Unitarian Universalist affiliated retreat center outside Highlands, North Carolina, welcomed us after several southeastern conference centers refused to accommodate a gay event. Harry Hay, founder of the Mattachine Society and the Radical Faeries, was invited to keynote the first Gay Spirit Visions conference. There were also presentations by visionary writer Andrew Ramer and Atlanta poet Franklin Abbott. And although now traditionally held around the autumnal equinox in September, that first conference was held in November. Read Harry Hay’s 1990 keynote address.